Last week our Women’s Empowerment Program Manager, Sarah van Boekhout, and Social Behaviour and Research Specialist, Janita Bartell, headed to Nairobi for the Bill & Melinda Gates Foundation conference on “putting women and girls at the center of development”. Organizations from around the world gathered to share ideas on how to get more women at the forefront of solving today’s most pressing global issues and, importantly, how to measure progress and success. 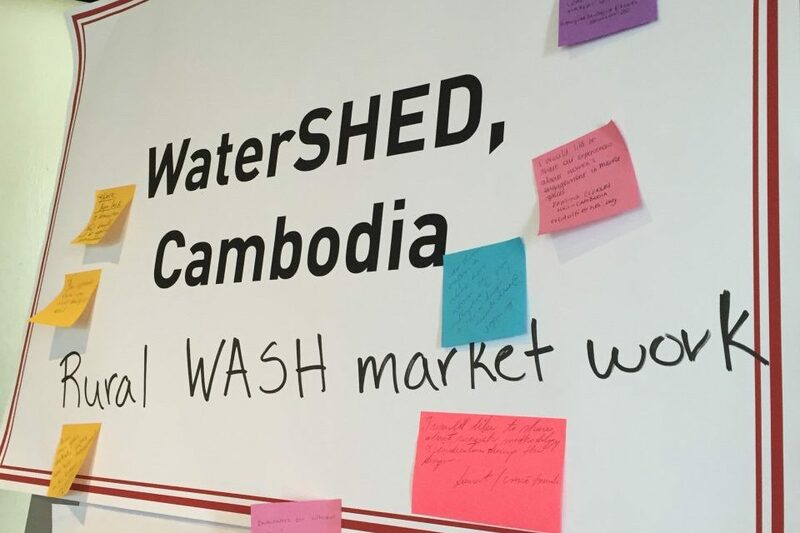 The conference was timely, occurring just two weeks before WaterSHED launches WEwork, our unique initiative to better engage women in water, sanitation and hygiene businesses (more on that soon!). Here are Sarah’s thoughts on what she took away from her time in Nairobi. When I landed in Nairobi with my colleague Janita, the top news headlines read “Lions escape: Nairobi on alert”. A fitting metaphor as I stepped off the plane. Just as the rangers had to wrangle the lions back into the park, we were embarking on a very different but equally crucial and time-sensitive challenge: breaking the barriers that prevent women from becoming leaders in the development of their communities. 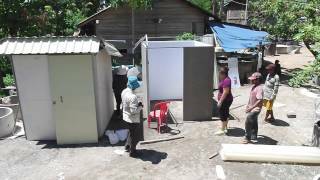 There are many such barriers, and as a result we have situations like in Cambodia, where less than 15 percent of toilet businesses are run by females. Without fully engaging women, Cambodia is unlikely to see universal sanitation coverage. But, creating an inclusive system is not a switch that we can easily turn on and sustain. It requires innovative thinking, and a global exchange of ideas. So, over the course of four days, we worked closely with representatives of 21 other women’s empowerment projects from around the world. Brought together by the Bill & Melinda Gates Foundation, we shared how we were “putting women and girls at the center” for health and development outcomes, and looked closely at how we might measure and evaluate the impact of our work. How to measure and evaluate our progress towards this kind of empowerment? That’s where the discussion turned technical, and everyone’s inner data geeks came out to play. 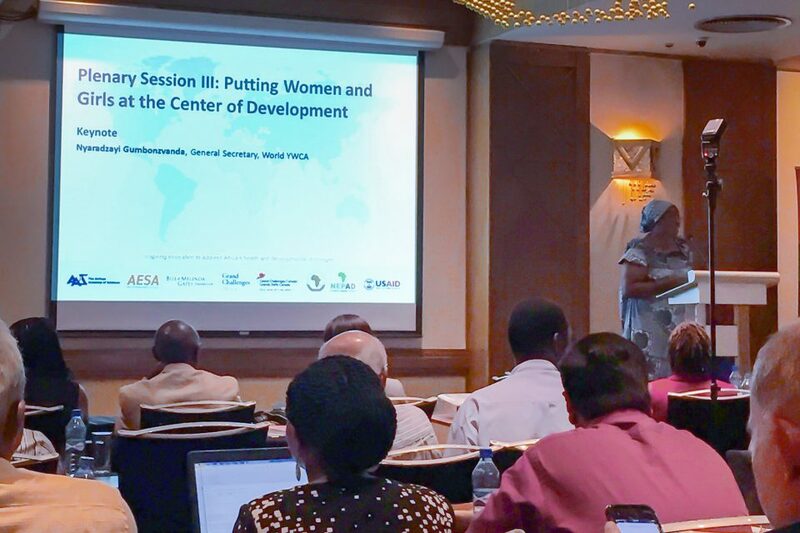 We conducted sessions on, for example, how to measure “time poverty” – that is, the extra unpaid burden that women carry worldwide, which saps their ability to be productive in the economy. Only the day before this particular session, Bill and Melinda Gates had released their annual letter, in which Melinda writes about how to “Recognize, Reduce, and Redistribute” the unpaid work of women, the effect of which has the potential to add $12 trillion to global GDP over the next decade. One tactic, she argues, is smart design: “The solution is innovation”. At WaterSHED we see clearly that well-designed WASH products – whether it’s a filter that enables a family to produce their own safe drinking water, or a toilet shelter that’s easy to clean – can save a woman’s time and energy, which can then instead be harnessed to reap the benefits of the lucrative market for toilets and other WASH products. Equally as valuable as the technical sessions was the interaction with our colleagues from around the world, who were working on everything from menstrual hygiene interventions in Bangladesh, to using sports for the empowerment of girls in South Africa, to exploring the access and use of digital financial services by women in Tanzania. In sharing our project with these global experts we fielded some excellent and encouraging feedback about our work to catalyse women’s empowerment in the water, sanitation and hygiene market in Cambodia. This feedback will help us to hone our approach and make it world class. At the end of the week, we walk away with a shared learning agenda around these ‘building blocks of empowerment’, and an armful of new techniques for measuring the progress of our approaches. We also now share memories of a few powerful moments. One of my favourites was when Doris Bartel, Senior Director of Gender and Empowerment at CARE USA, stood up and urged us to consider ‘bodily integrity’ and ‘pleasure’ as part of those building blocks of women’s empowerment. This made her an instant hero. Working alongside such heroes has been an important part of the value of being here in Nairobi, not only for Janita and I personally and professionally, but also in considering how we can celebrate role models as part of our Women’s Empowerment Project. The concepts of mentorship and peer support are integral to our objectives – we want to build a vibrant community of women who are concerned with improving water, sanitation and hygiene in their households and communities, who are curious to learn how that might intersect with their own empowerment, and who will work together in synergy for individual and collective success. In Cambodia, where social trust levels are exceptionally low, this is a ground-breaking approach. So, here in Nairobi we have forged connections with projects that also incorporate mentorship of girls and women – whether it’s part of a life skills program for young women in India, or in the exploration of using celebrities to drive public health messages. The 22 projects are all learning from one another, and this conference has certainly set the tone of ‘stronger together’. As the conference wraps up, I am coming away with a sense of awe at the innovative work that is being done to put the world’s women and girls first, as well as a sense of pride that WaterSHED stands among them. How Do We Measure Women’s Empowerment?